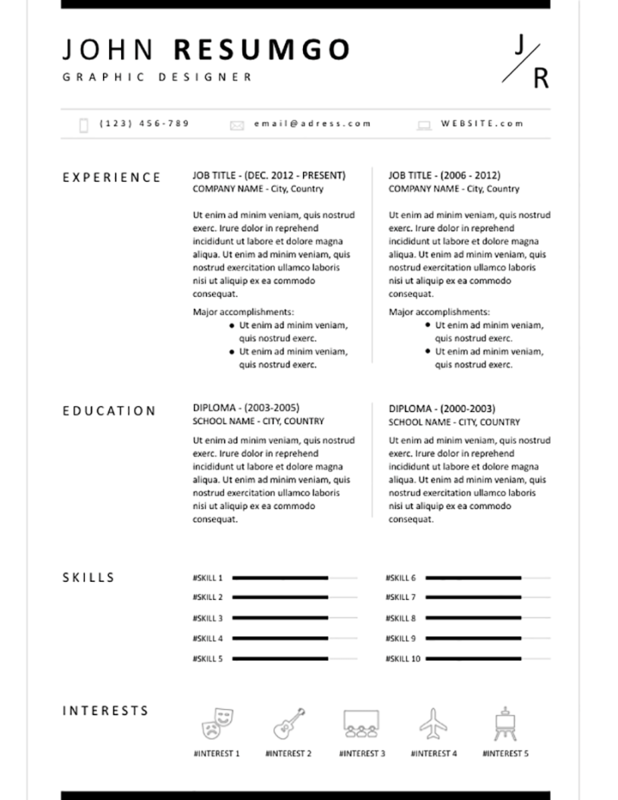 Bion is a classic yet professional resume template. Clean, and clear 3-column layout. This resume template is perfect for those who want to present only pre-selected condensed information, for students or for first job seekers. White background with light gray abstract shapes, and a thick border on top and bottom of the layout. On top, insert your name and job title (header). You can even use the placeholder on the right for your initials, in order to give a (more) modern touch to your CV. Your personal simple information will go in a horizontal banner with top and bottom border. For each part/category, your content will be displayed on a 2-column layout (right), while the titles will be isolated on a first (right) column. It should be noted that simple horizontal bar charts are used to illustrate your expertise for your relevant skills. Also, select your icons to be used for your interest topics among the Office 365 icon library.